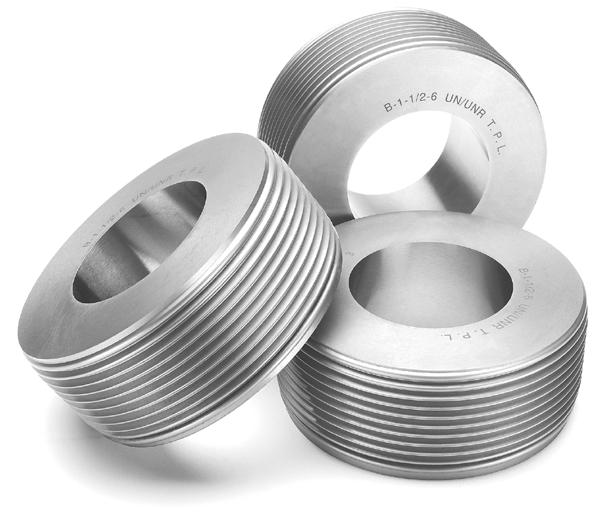 We offer replaceable machine dies for nearly every major competitive cylindrical die on the market, from “plain annular threaded” dies to the most demanding “specialty” dies. Dies are available up to 9” nominal O.D. with bore sizes to 3”. Need a quote on a machine die? Where the workpiece thread length is longer than the width of the dies, and the part axially feeds through held-on fixed center distance. Uses Cam-relieved dies on fixed center distance to roll part in one spindle revolution. Produces fractional H.P. motor worm shafts, automotive parts, headed parts, and studs at high-production rates. Where the left die is on a fixed center distance and the right cycles in and out, or both dies cycle in and out. Thread length must be less than die width. Used to roll motor shafts, worms, threads, gears, and splines. For today’s popular standard “all threaded” threaded-rod applications. For more specializing threads including Acme and worm threads used on linear control components and other long thread-length work that requires accuracy. For knurling motor shafts and annular applications. For threads, Acme, worm, gear and splines applications. For burnishing ball forms, motion control components, automotive parts, and work requiring fine micro finish and accuracy.